Although a Tulsa, Okla., ex-cop will go down in infamy for killing an unarmed black man on video while he had his hands in the air, a judge has recently ruled that the shooting death can be removed from her employment record. 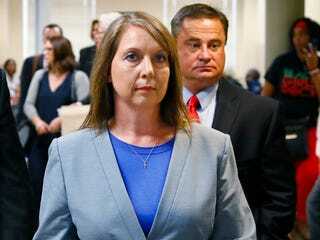 In May, Betty Shelby was acquitted of first-degree manslaughter in the fatal September 2016 shooting of 40-year-old Terence Crutcher; on Wednesday, a judge ruled that the death will be expunged from her record after Shelby petitioned the court in August. NBC 4 Washington reports that District Judge William LaFortune ordered all documents involving Shelby’s case sealed. The case will be accessible only through a court order and can be destroyed after 10 years, according to state law. This means that agencies will be unable to find the case during a background search, Shelby’s defense attorney, Shannon McMurray, told NBC. “Like any other citizen who is acquitted, Betty Jo Shelby was entitled to have her record sealed and expunged,” McMurray said. Shelby testified at her murder trial that she was scared for her life because Crutcher appeared to be on drugs, but video from a patrol-car dashboard and a police helicopter showed that Crutcher had his hands in the air when he was shot and killed. Shelby got her job back after the acquittal but resigned in July and now works as a reserve sheriff’s deputy in nearby Rogers County. Expunged or no, we all know who Betty Shelby is and what she did—as my colleague Kirsten West Savali noted, she wears the face of a killer. Read more at NBC 4 Washington.